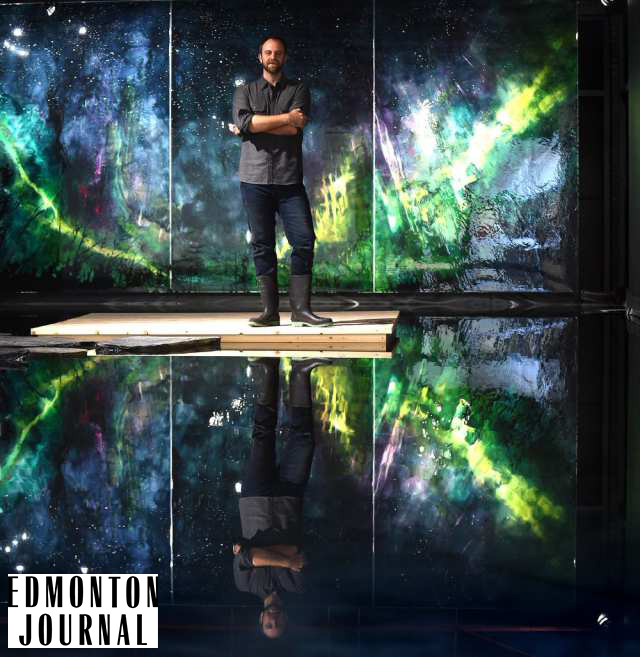 It’s not unusual to spot the Northern Lights in Edmonton, but this is the only way to experience them indoors — and you don’t even have to wait till sundown. Over the next few weeks, a visit to the city’s Peter Robertson Gallery should feel like a visit to the nearest National Park. Look up, and you’ll see the Aurora Borealis in peacock greens and blues. Look down, and you’ll see them, too. That’s because the entire gallery has been turned into a man-made lake — flooded with more than 11,000 litres of water. If you want a closer peek at the celestial landscape paintings hung around the space, you’ll have to hop along a path of stepping stones. (Some 3,000 pounds of rock were brought in for the experience.) Or try the floating boardwalk. With every step, you’ll make the sparkling reflections fracture and ripple. 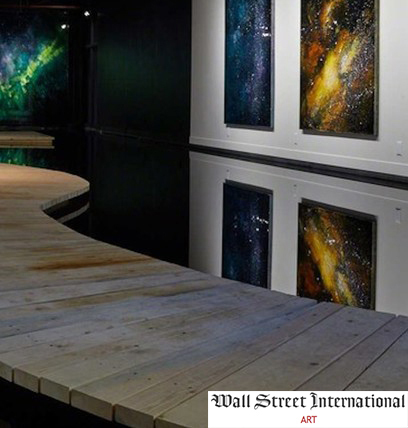 Steve Driscoll doesn’t mind admitting it took a little convincing for his dealer, Jamie Angell, to agree to have his gallery flooded with three inches of inky black water. “That and a few beers,” Driscoll laughs. 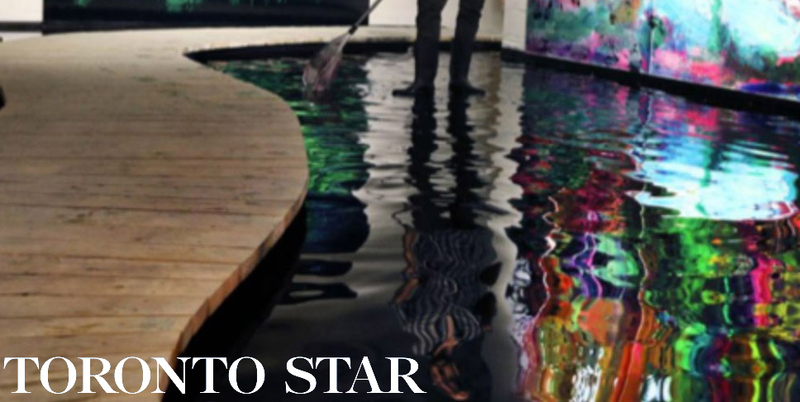 As he does, he’s pulling on boots to step into the same water in his studio, which he’s filled up as a not-so dry run for his show there on April 29. You get the idea: as a landscape painter, Driscoll’s not so married to romantic notions of plein-air impressionism so much as he is tuned to his very contemporary times. The pond, complete with boardwalk, acts as a reflecting pool for Driscoll’s day-glo compositions. Despite their scale, Driscoll paints them in a single day (mostly; Shore, a 9-by-40-foot behemoth, seen here, took two). That’s largely due to the fast- drying properties of his medium, a pigmented urethane that gives the work its artificial sheen. It helps place him in a genre of one: a landscape action painter. And working in the commercial advertising printing standard CMYK colour range, Driscoll brings landscape practice right up to the here and now. Just a Sliver of the Room, new paintings by Driscoll, opens at Angell Gallery April 29, 1444 Dupont St., Unit 15 (angellgallery.com). 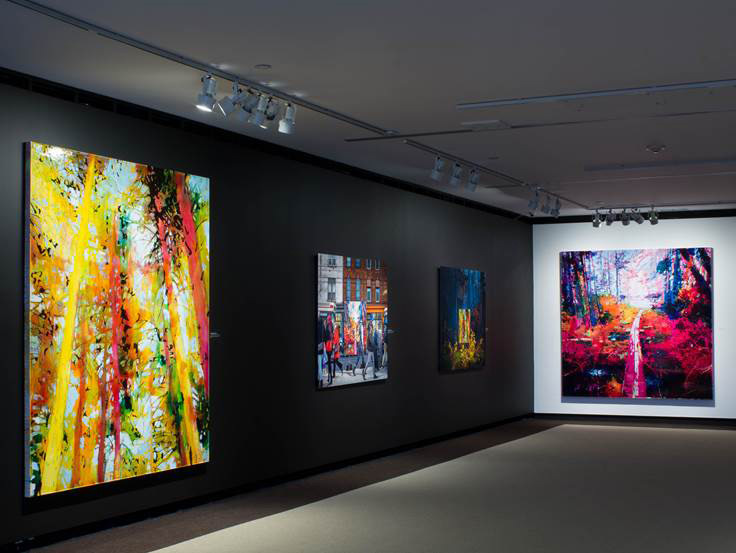 The show features six, large contemporary landscapes, which are undeniably stunning. But the backdrop demands equal attention. The dramatic representations are placed alongside a man-made lake and a winding boardwalk, furiously constructed by the artist and gallery staff over the last several days. A dock is anchored at the far end of the gallery, close to an expansive vision of northern lights titled These Are Truly the Last Days. 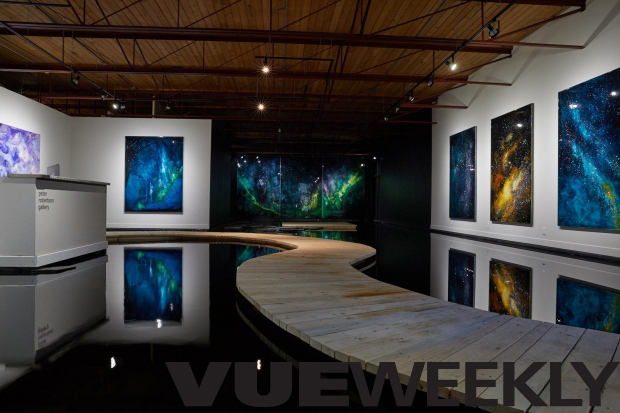 A dark lake has replaced the floor at Peter Robertson Gallery. Abstract celestial clouds, golden milky ways and the luminous glow of the aurora borealis dance in the reflective water. 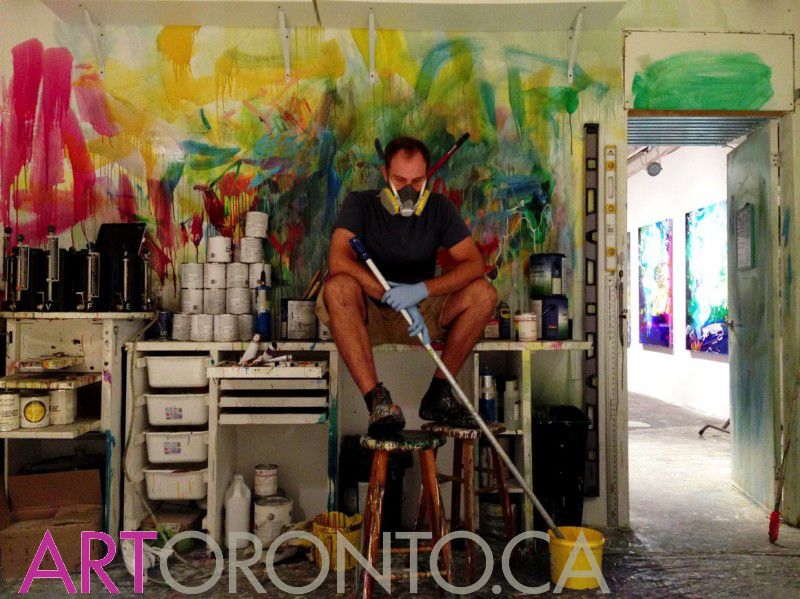 Toronto-based artist Steve Driscoll has 25 solo exhibitions to his name, but only one that requires a pair of wellies. Recovered Shores, on now until May 28 at the Angell Gallery, is a slice of Algonquin Park—lake, boardwalk, wooden bench and all—in the heart of the city. Guests can pace along the deck or wade in the shallow water, sending ripples toward a shoreline painted in psychedelic greens, pinks and golden-yellows. “I guess in some ways I’m trying to recreate a hike or a wander through the woods—on Dupont Street,” Driscoll says. We asked him how he turned an urban art gallery into a cottage-country retreat. The Peter Robertson Gallery in Edmonton is pleased to present Steve Driscoll: And a Dark Wind Blows, a suite of new contemporary landscape paintings by the highly regarded Toronto artist. Presented as an immersive installation featuring an artificial lake and boardwalk, the show opens Friday, October 14 (reception 7:00 to 9:00 p.m.) and runs through Saturday, November 5, 2016. The centrepiece of the show, the monumental These Are Truly the Last Days (title borrowed from a song by Montreal post-rock orchestra, Godspeed You! Black Emperor) presents an ecstatic vision of the northern lights. Created using Driscoll’s favoured medium of pigmented urethane, the three-panel painting contains passages of unsurpassed beauty, as swirling eddies of green, blue, purple and yellow-gold suggest nebulas, galaxies and rivulets of shimmering stardust, below a star-filled sky. Positioned at the long end of the gallery, it may be viewed from a wooden boardwalk over the flooded gallery floor, or seen more intimately from a small floating raft accessed by stepping stones. In his latest body of work, artist Steve Driscoll tips us off to what’s going on by borrowing the show’s title from a lyric by American songwriter John Prine. 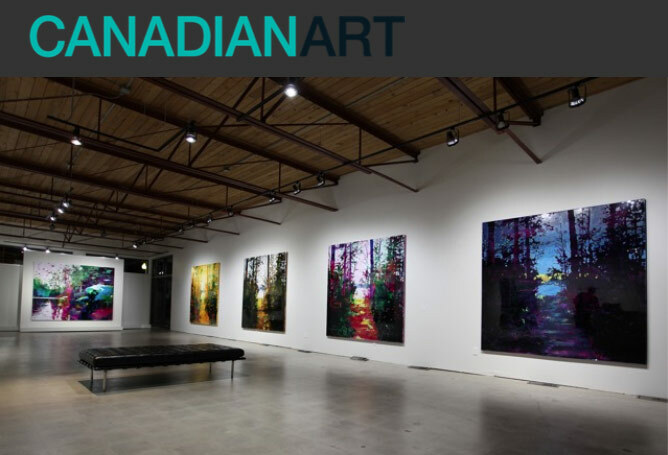 “Actually everything is just about the same” reflects a serial approach, in which the artist presents variations of four images of the Canadian wilderness, each painted in his signature medium of pigmented urethane. 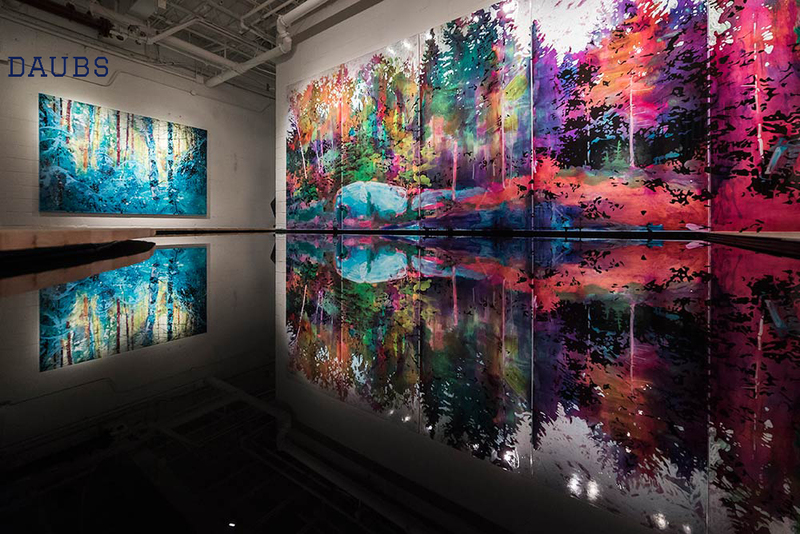 The sets represent moments from a canoe trip in Ontario’s Algonquin Park, a setting that looms large within Canadian art history as Group of Seven territory. Rocks along a shoreline and a waterfall are seen from the vantage point of the artist/voyageur as he paddles down a river. A canoe moored by the shore and a view of water glimpsed through a clearing in the trees represent the “land” portion of the journey. Just a Sliver of the Room marks a new phase for Steve Driscoll, the esteemed Toronto-based painter whose landscape paintings inject fresh energy into this traditional Canadian genre. For this exhibition Driscoll has created Recovered Shore, an eight-panel shoreline scene, ablaze with the colours of late summer. At forty feet in length, it is comparable in scale to Monets Water Lilies, and is Driscolls largest work to date. When the Peter Robertson Gallery described Canadian artist Steve Driscoll’s show, And a Dark Wind Blows, to me as “a water installation that would reflect his paintings”, I wasn’t sure what to expect. Maybe a few oversized tubs of water placed under the works? 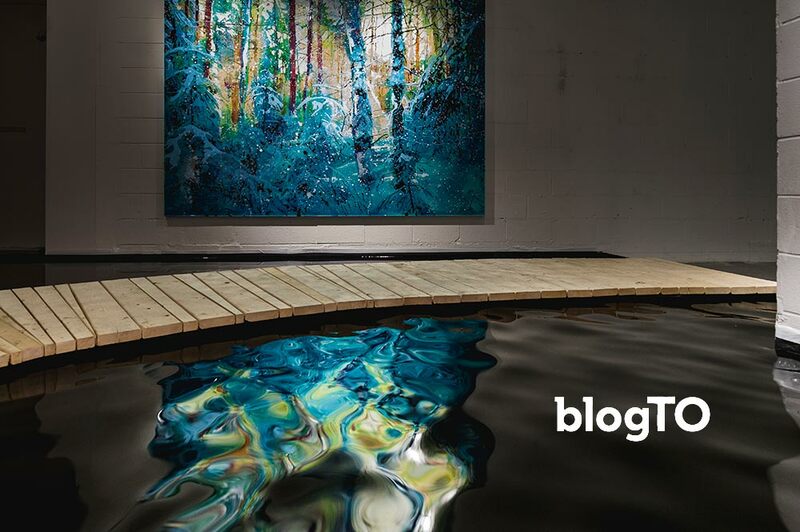 What I didn’t expect was what I saw when I went to the preview a few nights ago — the entire gallery had been turned into a lake. 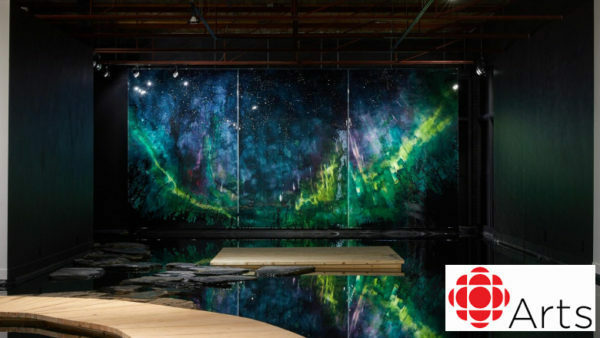 The works are all inspired by the night sky, and the show cumulates in a stunning three panelled painting of the aurora borealis, or northern lights. Though the paintings are hung on the wall like they would be in any show, the viewer can not actually get close to the pieces in the same way that you could in a more typical space. Instead, you must stay on the walkway that guides you from work to work at a distance. The Smoke Show series captures the smoke of a campfire, something unusual as the theme for paintings. Driscoll says that he is most interested in the process within his work. 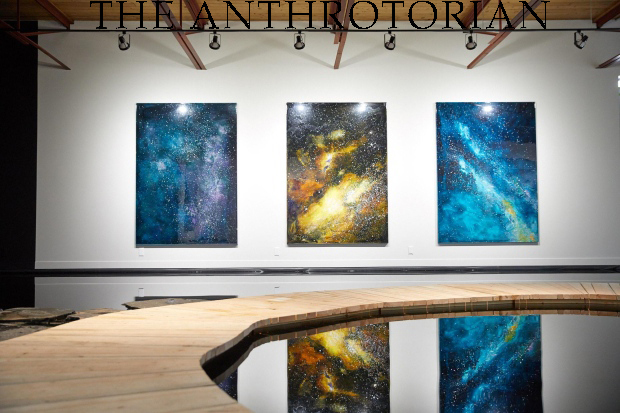 Every new show starts with experimentation in his studio and when he comes across a new way to manipulate a material or set of colours, he will look to nature to see where it can be applied. He uses the industrial material urethane that permits a watercolor-like translucency. In an effort to discover more about your unique perspectives created in paint what do you like to develop, before paint even hits a surface, to generate a concept or project? There are two main ways I work on development. The first would be studio experimentation, and the other would be getting myself out to nature. When I’m in the city there isn’t much time where paint isn’t hitting the surface. I like to work in a number of directions while I am coming up with ideas and compare my own reactions to those studies and experiments. The direction I usually chose is the one that most directly puts me into a felt experience. There is a certain sense of awe and wonder that I am always looking for in life, and the places I find it are in nature and the paint itself. I love being small in a huge theatre of a slow moving world. Watching paint move and settle compares to the experience of watching light reflect off of the waters surface. So I guess the time I spend watching and recording is where I do my development. You are currently showing at Angell in Canada, what does this body of work show and how has it differed from work previously completed? Yes, I suppose the main difference with this exhibition is that I focused on creating a more immersive experience. Not just in the individual paintings but also the gallery space as a whole. The installation includes a wall to wall pond which has a wooden boardwalk meandering over it’s surface. So the viewer has a distinctly different relationship with the paintings and a typical gallery experience. After completing the first couple tests with a mini pond in my studio I realized that there would be no point bringing nature inside unless I was willing to paint on the scale of nature. The main piece in the installation is 9 feet tall and 40 feet wide, turning a corner in the gallery midway. The result compares more with a walk around an actual woodland lake than a stroll through an art gallery.